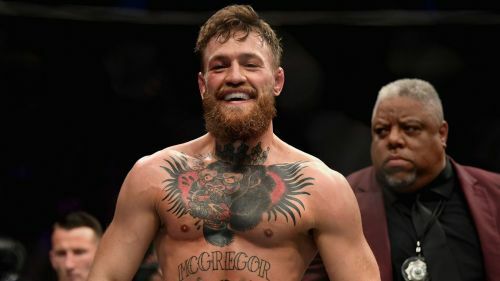 UFC star Conor McGregor says he is inspired by Juventus' Cristiano Ronaldo and has urged his boyhood club Manchester United to appoint "special man" Ole Gunnar Solskjaer on a permanent basis. Ronaldo, one of United's all-time greats, trained with McGregor in 2016 and the latter has revealed his admiration for the 34-year-old, whose hat-trick for Juventus against Atletico Madrid last week saw them progress to the Champions League quarter-finals. "Cristiano is a phenomenal athlete, person and entrepreneur," McGregor said. "His all-around discipline, perfectionist attitude, and dedication to his craft is inspiring and has inspired so many young children to play football. "Just look what he did recently in the Champions League - at 34 years young, a hat-trick under the lights when the pressure was on for all the marbles. And against Atletico Madrid, one of the best defensive sides in Europe. That is inspiring. "We are both disciplined athletes at the top of our game." United are also in the Champions League's last eight, Solskjaer's side overturning a two-goal deficit in the first leg by beating Paris Saint-Germain 3-1 in France. "Ole Gunnar is a special man," McGregor added. "I think he's done an incredible job with United. They have to give him the job permanently. You can feel the pride and passion he has for the club and its history." McGregor revealed his respect for Solskjaer's former United boss Alex Ferguson too, admitting he was captivated by United's "success and winning mentality" during his time in charge. "They had the don of football at the helm, the legendary Sir Alex Ferguson," McGregor said. "To have that much success over such a long period is remarkable and something I continue to aspire to. And he did it by nurturing youngsters into stars and not by spending and spending and spending like some of these other managers." Ole's at the wheel! Solskjaer gets Manchester United job - Manchester United fan reactions!